Google Hangout to replace Google Talk? Google is replacing its Chat gadget on Gmail with Google Plus Hangout, with photos, emoji, and free group video calls! Some people want the old chat feature, and not join yet Google Plus, another social network with contacts that were supposed to be private to begin with. Some features may not work correctly. Upgrade to a modern browser, such as Google Chrome. A recent report by Nielsen Online revealed the Internet penetration numbers in the Arab region. The numbers are an eye opener on who the heavyweights in the region are, and where Arab startups (or international companies targetting the region) should be investing. What the report doesn’t address is the online payment capabilities in each of those countries. Internet access with the no commerce capabilities can only encourage consumption websites (news, brochures, blogs, …) with limited monetization potential, rather than full-fledged online services, and the numbers above only tell one part of the story. 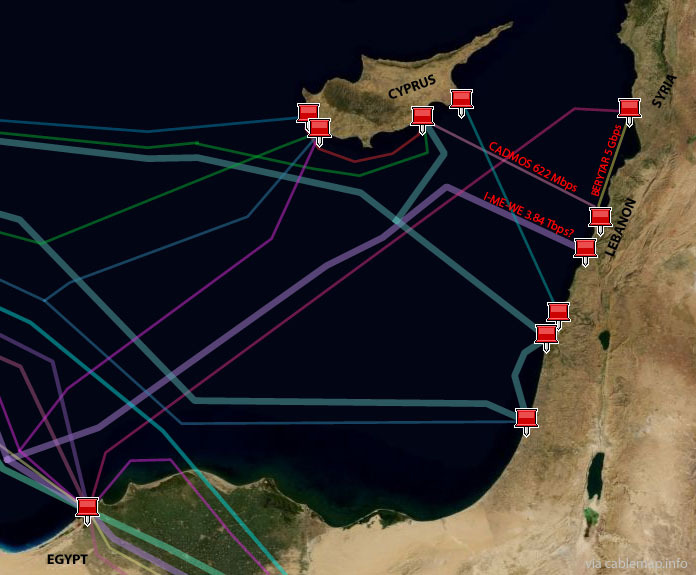 New submarine broadband cable for Lebanon in 2010? The “I-ME-WE” cable is a new 12,000-kilometer submarine cable system that comprises three optical fibre cable pairs, connecting France to India via the Middle East. BERYTAR (134 km) connecting Tartous in Syria to Beirut (5 Gbps) operating since 1997. CADMOS (230 km) connecting Pentaskhinos in Cyprus to Beirut (622 Mbps) operating since 1995. The "I-ME-WE" cable is a new 12,000-kilometre submarine cable system that comprises three optical fibre cable pairs, connecting France to India via the Middle East. Beirut Airport Adds Free internet Wi-Fi! The Minister of Telecommunications Eng. Charbel Nahhas announced yesterday that he worked very closely with the Beirut International Airport to provide free Wi-Fi as a holiday gift now through September 15, 2010. In the process of regulating the internet, and fostering freedom of expression in Lebanon, the Ministry Of Telecommunications in Lebanon added free on top of paid Wi-Fi: The authority decided to put out $90K for equipment and foot a $41K per year bill for service with 15 Mbps backhaul to handle what they believe will be 1,000 daily users. Several companies are working with the airport on providing advertising. Just bring a WiFi-enabled laptop or mobile device and stay connected to family and friends for free while you travel!